A recent retreat opened my eyes once again to how much we depend on the availability of our electronics. We have a tendency to use them to distract us from whatever is going on, or not going on, within us. What I mean by this, is that there are currents of emotions, reactions, even insights bubbling up from within us all the time, yet, if it is in the slightest uncomfortable, we often reach for a distraction. Oh sure, it used to be the radio, the TV, chatter, gossip, reading, or somehow becoming absorbed in an activity as a distraction. But it was harder then to ignore those impulses driving us to pay attention to our emotional climate. Now, you always have these great little devices to turn to immediately. It even seems like an addiction. Watching us wean ourselves away from our social media, texting, TV, phone, etc. 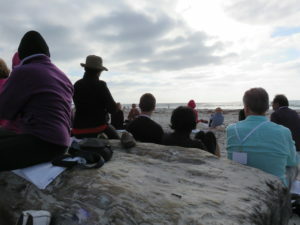 at our silent retreat was revealing—showing just how much they have stolen big spaces of time in our lives. The social media industry has carefully crafted their products to alert us constantly to act, to look, to get involved with our devices. Some of the participants could not bring themselves to separate from their phones. Superficially it looks like another ‘soft’ addiction. Why do we have addictions? Because they take us away from something uncomfortable. What? We have so many things to distract us sometimes we don’t even realize we’re unhappy. As soon as any unwanted feeling comes up begging for our attention, we reach for a cell phone or tablet, or TV or food or drink, and it just gets submerged again. When we go through times that leave a painful feeling, it resides within us until we give it it’s due. It is similar to digestion. It is as if we ate a bit of tainted food and it leaves a lingering discomfort in our stomach, only in this case it was a painful emotion, and we pushed it down. When things happen around us to trigger that same feeling, it reminds us it is still there. It wants a transformation into something else: i.e. knowledge, wisdom, growth, release, back to wellbeing and joy. In other words, it will be digested. This is spiritual warrior work. When I was young I used to fantasize how nice it would be to live in a monastery, away from the world and its problems. But now, with my short adventures into silent retreats, living in prayer and meditation, I know it is only for the courageous souls. To have no distraction enables things to come up that you’ve been ignoring, or pushing back down and you’ll have no means to avoid them. On this last retreat I asked in an offhand prayer for a resolution to my feelings that were coming up about a family member who isn’t even around any longer, but I knew I was still holding resentment; there was unfinished business. The very next day, sitting in meditation, a huge surge of love enveloped me, beginning deep in my gut and moving up swiftly into my head until the joy pushed tears down my cheeks. Within the love was forgiveness, bliss, and a joy that totally overwhelmed me. I felt as if I was a tiny spec in the universe at the same time I was as huge as the whole world. And now that resentment is completely gone. It went through the fire of transformation. Why am I distracting myself? Realize you drew a conclusion about whatever triggered this emotion, possibly from your childhood, and you crystalized it into a belief. Inquire within, what does this mean? You don’t need an answer right away, it will come to you in time. And let go. Release it through a ritual. When we constantly distract ourselves, we are missing an opportunity to resolve long held grievances, traumas, resentments, fears and guilt. Allowing these to come into our awareness not only helps us heal emotionally, but our physical body will thank us too. It is holding this memory until we are ready to face it. *If you have serious emotional issues or if you are under the care of a mental health counselor, please seek professional guidance before trying these exercises.